I Come in Peace (originally produced and released internationally as Dark Angel) is a 1990 American science fiction action film directed by Craig R. Baxley, and starring Dolph Lundgren, Brian Benben, Betsy Brantley and Matthias Hues. The film was released in the United States on September 28, 1990. The film is about a rule-breaking vice cop who becomes involved in the investigation of mysterious drug-related murders on the streets of Houston, Texas. 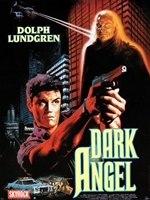 The original title is Dark Angel; the film was planned to be released under the same title in the United States (which had the latest release) but was renamed by Triumph Releasing to I Come in Peace because of two other movies entitled The Dark Angel (from 1925 and 1935), according to executive producer Mark Damon (in a 1993 interview with UK magazine Impact) who preferred the original title.